Chaotic, messy, frantic... we were lucky to make it out of the Beverly Center H&M with limbs intact. 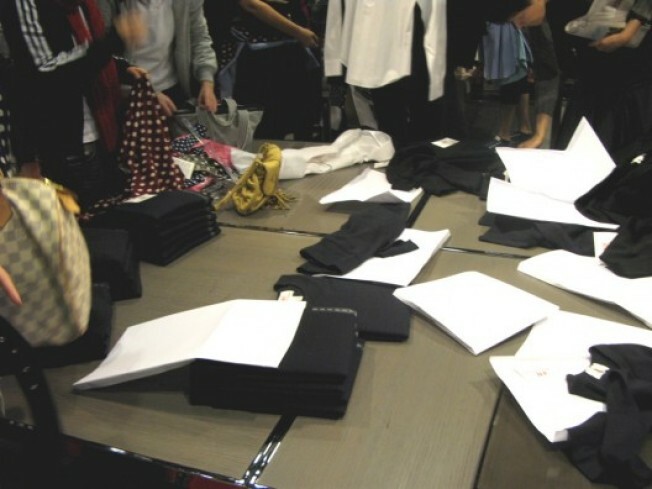 The Comme Des Garcons launch had people grabbing items by the armful. Unless you were one of the first 20 or so in the store, you didn't stand a chance. Within 10 minutes, most items were scooped up and headed to the register. The people buying in bulk left us wondering if the garments had an eBay auction in their future. We tried on some basic tees and were surprised at how uncomfortable and unflattering they were. The fabric felt completely untreated and the fit was short and square. The black long-sleeved tee with white polka dots was insultingly over priced at $25. The scarves and jackets looked great, but had already been claimed before we could try them on. The collection was limited, and it sold out in under 20 minutes (aside from some not-worth-it plain blouses). If you were lucky enough to score something sweet, let us know in the comments how it fits.